Our furry family members hold a place in our hearts long after they’re gone. 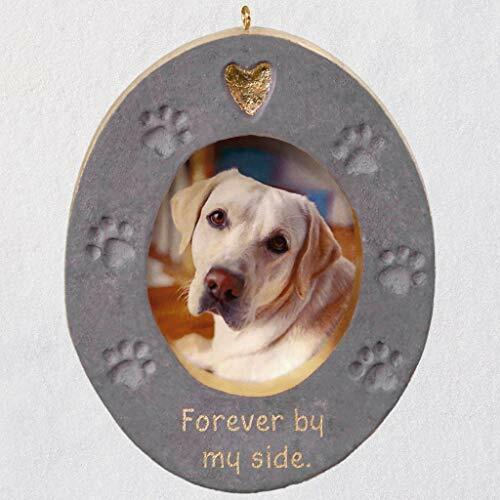 Share this lovely remembrance gift with someone who has lost their beloved pet, or add it to your own decor to honor a special dog or cat that has crossed the Rainbow Bridge. Picture frame Christmas tree ornament features space on the back to add your pet’s name and a favorite memory of them. Designed by Tammy Haddix, this concrete Christmas tree ornament holds a photo. Pre-packaged in a box for easy gift giving, preservation and storage. Dated 2019 in copyright. On ornament: Forever by my side. Picture frame area: 2.23″ W x 2.69″ H.
Concrete Christmas tree ornament is lead-free and measures 3.33″ W x 4.38″ H x 0.6″ D.